Progressive Language is designed to offer an easier way to steadily build up a user’s vocabulary. No matter how it happens, developing language is a complex task which takes time and effort. Think about it - for many babies, it takes over a year of being constantly exposed to language from everyone around them to even be able to say a few words. It’s a gradual process, with memorization and trial and error along the way. When we started visiting schools and speaking with parents of Augmentative and Alternative Communication (AAC) users, we could understand why many of them were hesitant to offer a system with a full vocabulary to new AAC users who were just learning basic communication skills. 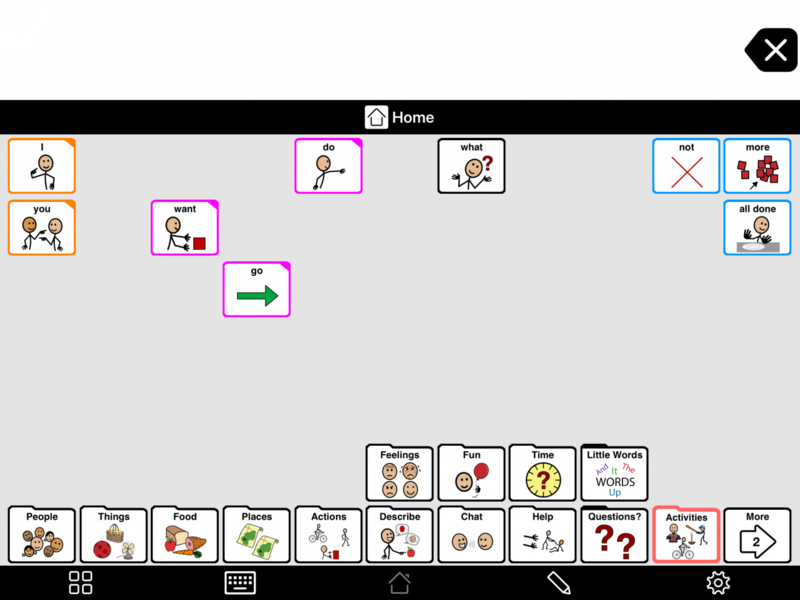 The worry for many people seemed to be that if an AAC user would become frustrated or overwhelmed too early on, it would be difficult to keep getting them to communicate using it. We know that many speech language pathologists (SLPs) consider it best practice to presume a user’s competence. One way of doing this is to offer them as many words as possible as soon as they start using AAC. Still, we wanted to strike a balance: between having access to what they might want to say, and making it possible to introduce words in a way that might be considered less overwhelming. One of the main benefits of Proloquo2Go is different pre-programmed grid sizes. Space is precious in an app. Using smaller buttons, you’re able to see more words to choose from without having to go from one folder to another to find what you need for a basic sentence. This feature makes the app beneficial in the long term - but what about the here and now? When we spoke with our users, we noticed people making their own adjustments to limit the buttons that an AAC user would see. They would start with few large buttons. To accommodate this, a smaller grid size with fewer buttons is displayed. As time went on, they would gradually increase the grid size so that more buttons would be available per page. Another strategy we saw people using was starting with the recommended large grid size with many buttons, but manually hiding the majority of words from view. They would then slowly introduce them as they felt the user could handle more. We were inspired by our user’s resourcefulness, but we knew that these kind of adjustments weren’t ideal - for the person making the adjustments, or for the AAC user. Changing the grid size multiple times can be confusing for a user. As soon as they learn a word and remember where it’s located, the button can get relocated to a different place when the grid size is changed. Manually hiding and revealing words is also very time and labor intensive, as you have to repeat actions throughout every folder. And finally, core word vocabularies and their layouts are constructed based on extensive research, designed to support language learning. If a user starts removing words without understanding why they are there in the first place, it can end up making it harder or more confusing for someone to learn. The Progressive Language feature is our answer to the concerns of our customers. It’s designed to start with a limited view of the full vocabulary. The parent or therapist can then gradually increase the number of words displayed, in a pattern designed to support learning and language development. Compared to resizing the grid, this feature keeps the buttons in the same place. When more words are introduced, this makes it easier for the user to recall the position of the words they’ve already learned. Keeping frequently used words in consistent places takes advantage of one of the ways we learn how to do things - motor planning. For example, you can start with a large grid, with 77 or 96 buttons. These should still be large enough for the user to effectively see and touch the buttons. With a grid of 77 buttons, step 1 will display 23 buttons, including 9 core words and 14 folders with fringe words. In your next step, you’d add four more core words. After that, each step would have about ten new core words. The user gets a chance to become familiar with one set of words, and you can move on the next one when they’re ready. This can be done by manually hiding buttons, but it would require a lot of work for the parent or therapist. Progressive Language also takes effect automatically throughout the vocabulary, hiding words on every folder they are displayed. In each step, the same core words on the home page are also shown on the fringe pages. When using Progressive Language, you might sometimes need to use a word that’s hidden – and we’ve thought of that too. All you have to do is use the Explore mode to check the rest of the words in the full vocabulary. And if there is a word that you need to show before it’s revealed by Progressive Language, you can make it visible manually in Edit mode. There are features similar to Progressive Language available on other AAC systems, but none of them offer a similarly comprehensive experience. Other solutions provide you with alternatives to the full vocabulary. These are something like a list of suggestions which you can manually hide yourself, a separate screen with limited words that isn’t integrated into the flow of the rest of the app, or a beginner’s setting, with few words at a very basic level, and no way to transition between this and the full vocabulary. Progressive Language is designed to offer an easier way to steadily build up a user’s vocabulary. It also ensures that it will be based on solid clinical and developmental knowledge. Alongside our multiple vocabulary sizes and customizable grammar support, Progressive Language is just one of the ways that Proloquo2Go is a flexible system designed to work for users now, and in the future. Progressive Language helps your communicators progress to full communication! To make the user's language skills grow, we recommend choosing a large grid size. Hide buttons that the user is not yet ready for, and gradually reveal them as the user progresses. This is a complicated and time-consuming task. 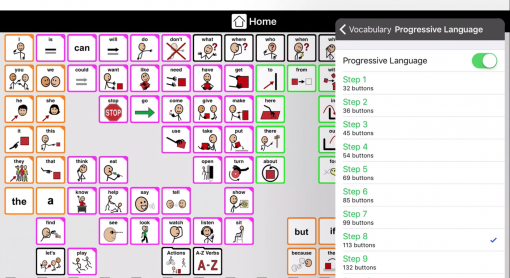 Our new Progressive Language feature helps you to hide and reveal buttons in a developmental order. We should always presume competence for a person with communication difficulties. Presuming competence affects how we make choices around AAC, and how we provide opportunities and access to words, communication functions and the alphabet.